Coffee hour immediately following the service. Please join us! 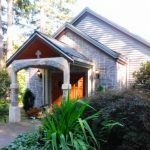 On Sundays: Nursery care, Sunday School, and an audio/video feed of the service in the parish hall are all available as options to those with children. Upholding the faith, order, and worship of Christ’s One, Holy, Catholic, and Apostolic Church, St. Bartholomew’s exists to glorify God by living the Great Commandment and Great Commission, joyously celebrating the mystery of the Incarnation in the rich Anglican tradition. Feel free to return to this site regularly to learn more about us and our journey together as a forgiven and forgiving Christian community from around the Seattle area. Ultimately, though, the best way to experience the fullness of “the Faith once delivered” (Jude 1:3) here is to “come and see” (John 1:39). You are warmly invited to do so this Sunday at 10am. St. Bartholomew’s is a member parish of the Anglican Province of Christ the King. The parishes of Christ the King are open to all who seek the comfort of the Holy Sacraments, the guidance of Scripture, and God’s companionship and love. If you are seeking a timeless and vibrant faith, with beautiful liturgy using the 1928 Book of Common Prayer, traditional music from the 1940 Hymnal, and Biblical preaching, we welcome you!